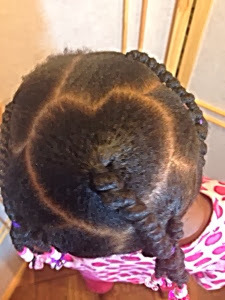 So my little one wanted some heart shapes in her hairstyle for Valentine's day. I tried to do more than one but I could only carve out one. It was not perfect either but I think one was enough to reduce manipulation. The most important thing is she ended up liking the one heart and her little beads. 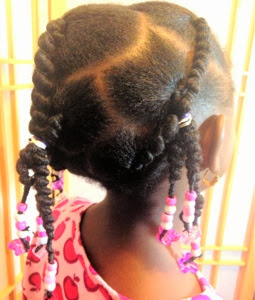 I have missed styling her hair using African Threading. 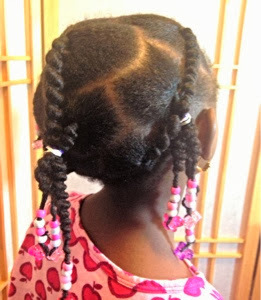 Although I handle her hair delicately, we are taking a break from cornrows and any other stress-induced styles that her tender scalp can't handle all the time. 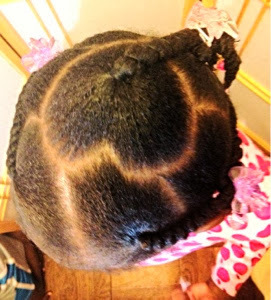 I don't like to list products used because it is not about the products, however, I have seen an improvement on her edges using the Nubian Heritage Masque. 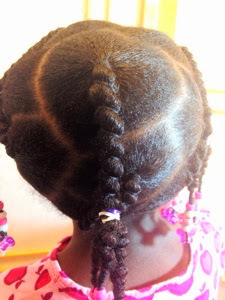 I used their pomade from the same line to smoothen her hair down before threading. And of course, I used the weave thread sold at all beauty supplies stores. 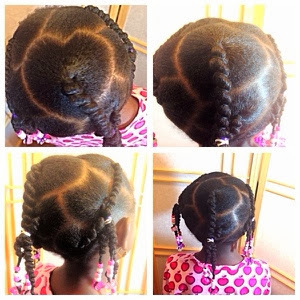 The beautiful thing about this style is that the look can be changed every week. The length of the plaits can be shortened or lengthened without cutting the hair or adding extensions. The threading method used determines the look of the style. Stay tuned to see variations of this style.